Caption slip reads: "Photographer: Emery. Date: 1951-09-22. 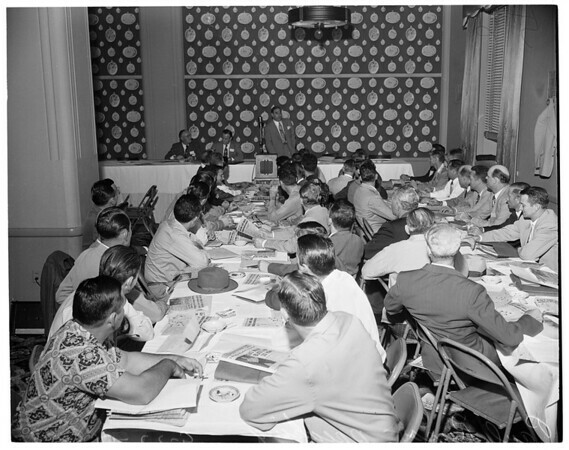 Assignment: Annual sectional conference, CIO-UAW 9-22 to 9-23, Wilton Hotel, Long Beach. 48/49: Jack Livingston, of Detroit, Nat'l. director of of United Auto Workers (CIO) Aircraft Department, at press conference at Wilton before opening of 2-day 'closed sessions' meeting. 56: Paul Russo of Detroit, assistant to Livingston, opens 2-day meeting at Wilton".